Design of the water delivery system will be based on water requirements of the field. Two factors must be known before design of the water delivery system can be done. These are: system gallonage and system operating pressure. Gallonage of the system will depend on the particular installation. Some items that affect gallonage are: acres irrigated, crop requirements, climatic conditions, soil type, terrain and availability of water. Regardless of the type of irrigation system or sprinkler distribution package, all systems require a certain pressure to operate properly and mantain uniform water application. Pressure requirements for center Pivots (electric/water), corner systems, linear systems, etc., are based on pressure needed at the outer end of the system for various types of distribution packages that might be used. Pressure requirements are different each type of sprinkler package. Selection of sprinkler packages is based upon a number of considerations: crops, soils, terrain and energy. Soil intake rates depend on soil particle size, surface condition, slope, moisture content, density, layering and organic matter content. Great care must be taken to design sprinkler application rates to meet crop requirements and match intake capabilities of the soil. High pressure impact sprinklers tipically have wider wetted areas and are used on heavy soils with slopes and higher gallonage requirements. Low angle, low pressure impacts typically have larger water droplet sizes, less evaporation, wind drift and energy costs. 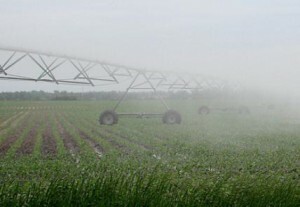 Once the sprinkler type has been selected, the operating or Pivot pressure must be determined. Operating pressure is based on: end pressure, friction loss through the system, pressure regulators usage and elevation of highest above Pivot. Water flowing in a pipeline is always accompanied by a loss of pressure due to friction. The degree or amount of loss depends on the smoothness of the inside of the pipeline, the diameter of the pipe, the velocity, any change of direction of water flow, the length of the pipeline and the quantity of water flowing. Calculation of the system pipeline size and friction loss in an irrigation system can be run on Val-A-Net or calculated to determine Pivot pressure requirements which will eventually be used to determine horsepower requirements to provide water to the system. Center feed designs will require significantly less power than end feed designs. High gallonage / high acreage systems may require combinations of larger pipe diameters near the pump unit and smaller pipe diameters away from the pump unit. Combination pipe sizes require a few extra design steps in figuring pressure loss. Maximizing the pipe diameter will normally result in lowering the power requirements and/or allowing greater capacity.